Minimum Viable Program for PIC12LF1572 | ad hocumentation • n. fast, instinctive documentation of ideas and solutions. Kevin Chubb (currently a final-year project student here in DIT) is designing a tiny robot using Microchip’s compact PIC12LF1572 microcontroller. It’s an interesting chip and Kevin’s doing great things with it. I decided to strip back one of the example programs he sent me just to find out exactly what’s required in the code to get a minimal program (flashing LED) working. In this example, I’m just blinking an LED twice a second on pin RA5 (pin 2). Thanks for the example code Kevin! If the location of pk2cmd is not included in the path, you’ll probably need to specify its location in the command. Unplug your PICkit 2 and then plug it back in. It should now be possible to use pk2cmd without sudo. Thanks for the useful tip Thai Phan! Thanks again to Kevin Chubb for the example code. This entry was posted in Uncategorized and tagged example, FOSC, Kevin Chubb, LVP, MCLRE, Microchip, PIC12F, PIC12LF1572, PICkit 2, PICkit2, PK2DeviceFile.dat, simple, tutorial, WDTE, XC8. Bookmark the permalink. Can’t help but notice you use ‘sudo’ for pk2cmd. I guess it is for permission to use USB port. This can be fixed by adding a udev rules for pickit2. unplug then plug back in your pickit2. I love how pickit2 works. The comment on line 12 actually came directly from Kevin’s original example code. I guess he just included the labels to explain what each configuration setting was controlling and then switched them on and off to figure out what worked. Anyway, I’ve adjusted the comments on lines 9-12 so that hopefully they’re all consistent now. Regarding the udev thing, I’ve never bothered setting it up before because I’m just not that worried about running pk2cmd as root. Of course, your way is better practice. Thanks very much for the clear instructions. I’ve added them to the article above – I hope that’s ok with you? I too love the PICkit 2. I think I’ve been using it for about 10 years now, both in my own development work and in classes I’ve been teaching, and it has been an amazing workhorse. I’d love to be able to do some things in Linux that I can do with the PICkit 2 software in Windows (e.g. Logic Analyzer, UART Tool). As a matter of interest, have you found any way to do that? Regarding udev, yes, please use whatever I wrote because I just googled it from someone else on the Internet. 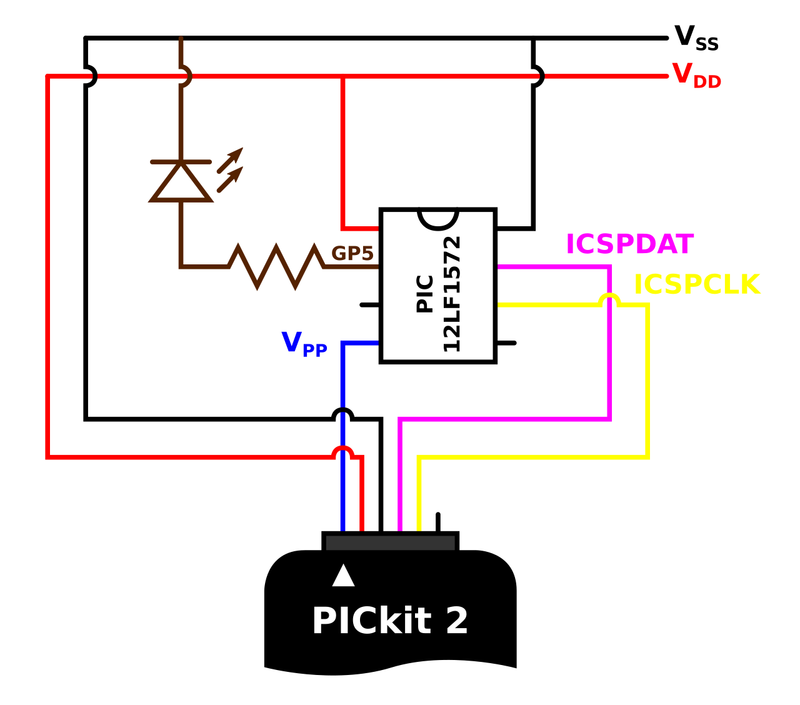 About pickit2 other function in Linux, I did find something about pickit2 emulating a uart-usb converter but I forgot the link. If I found it again I will definitely post it here. I’ve been following your blog since maybe 2 years ago. Great blog Ted! 1. pk2-la: pickit2 as logic analyzer. Need python-usb package. So just install in from the repo. But I still haven’t figured out how to use it yet.